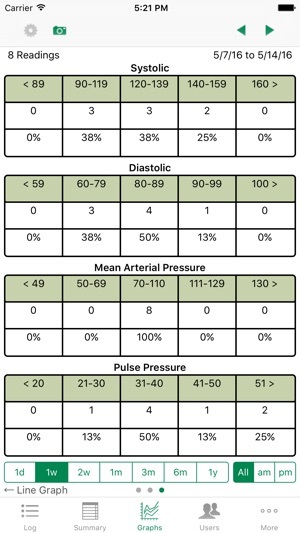 iBP is a blood pressure tracking and analysis tool. Please note, it is not possible to measure your blood pressure by touching the screen. A separate device is required. What kind of analysis does iBP provide? iBP uses color icons to indicate when your blood pressure values are normal, high, or hypertension. It also provides interactive graphs that allow you to display your values by weeks, months, year and time of day. The graphs display lows, highs, averages, and trend lines using statistical analysis. 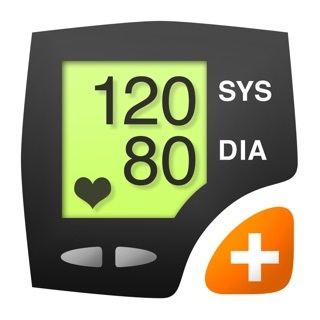 Why iBP vs. other blood pressure apps? iBP is a universal app designed to work on the iPhone, iPod Touch and iPad, which means you only pay for the app once and you get all versions! iBP is the only blood pressure app with a built in transfer capability to sync all your iOS devices. 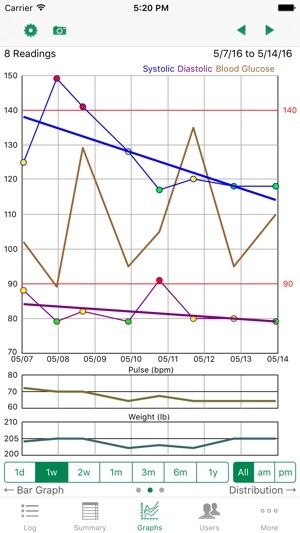 iBP is now able to read and write Apple Health blood pressure, pulse, and weight data. 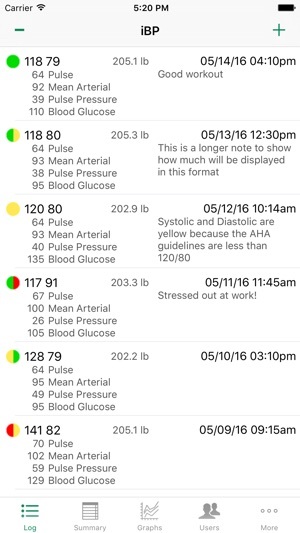 If your blood pressure monitor (i.e., Omron, iHealth, Withings) adds data to Apple Health then you can easily import that data into this app. 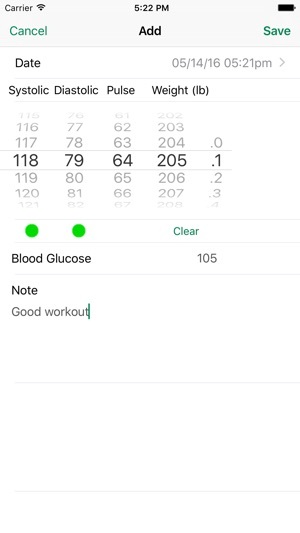 If you manually input your data into this app, then it will write that data to Apple Health. Withings + iBP = No more data entry! Disclaimer: iBP is intended to be used as a means to collect data to be shared with your doctor. This application is not intended to be a substitute for professional medical advice, diagnosis, or treatment. We assume no liability for any personal harm or injury sustained as a result of using this application. Great product and support! Highly recommend! My initial review is below; which was years ago. iBP continues to be a fantastic app. Easy to use and sync between my devices. I use it almost daily. I'll start by saying I had been using HeartWise (iPod) app for 3 years. It works great and I had no problems with it. Then I got an iPad. Heartwise charged me an additional 2.99, just a few weeks ago, for the (iPad) app, which I later found out would not import data, even it's own (at least easily)! I tried to contact HeartWise recently on two accounts regarding this ... no response. I tried to go to their support page and got some error message. That's when I found iBP. I got iBP 2 weeks ago. I had some issues, importing my HeartWise data. However, iBP support not only contacted me back within a day, but took care of my issue and I now have all my data in iBP and using it without issues and am very pleased! Lastly, I heard that the HeartWise app was abandoned, although unconfirmed; they last updated their app(s) in 2010. I've been using this app for 5 years. It makes the job of recording and tabulating my BP data amazingly simple and highly functional. After I weigh myself at home, I take a BP reading on my Omron BP device, I record the data immediately, along with a brief note concerning anything about how I feel or whatever I think might have affected my reading. This takes less than a minute on the iBP Blood Pressure. I also record readings taken whenever I visit my doctor's office. 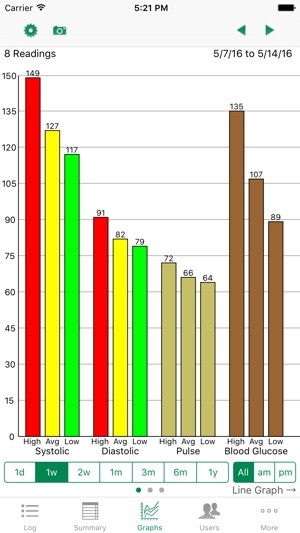 This app includes incredibly easy-to-read charts and graphs. The developer has created the finest example of simplicity, readability, and functionality of all the hundreds of iPhone apps I have used. Period. 5-STAR app with no reservations! 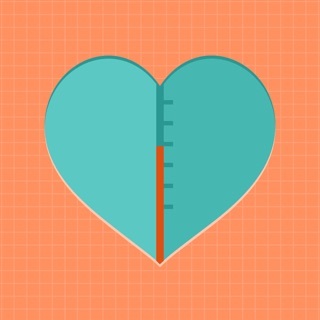 PS I believe that using this app regularly is one reason that my overall health has improved considerably. It would be an incredible bargain at 10X the original cost!